I think everybody has published some format of their newborn essentials. It is funny how everyone has an opinion on this matter. When I was pregnant, new mommies would always submit their words of wisdom on baby gear. I actually didn’t mind it though, in fact I often went in search for these lists and advice. I liked to read other mommy’s reviews, thoughts, and opinions and I would always take it into consideration before buying my gear. So in the interest in hopefully helping other mommies out there, here is my list. This is what saved me when SJ was a newborn. 1. Ergo baby carrier Whatever you do, DO NOT get the baby bjorn. I had this one originally and it screwed up my shoulder and neck pretty bad. The ergo distributes baby’s weight evenly between your upper and lower back, making it much more comfortable. 2. Aden and Anais Swaddle Blankets SJ didn’t swaddle, he liked to be free as a bird, but we used these multi-use blankets for everything else. Specifically they make amazing burp clothes. SJ is a spitter, so it is nice to have something more substantial than a tiny little burp cloth to keep around. This is a staple in the diaper bag. 3. Chicco Snap and Go Stroller This will save you when you are on the go I promise!! (By the way I highly recommend the Chicco Keyfit carseat, it is the safest one by my research). We also have a bumble ride stroller that is good for walks or longer outings, but when you need to get in and out of the grocery store with an infant you don’t need a big bulky fancy stroller. This is lightweight, fits easily in any car, and can open in one hand. You just put the car seat directly on it and you are done and ready to roll. It is seriously so easy and sometimes you need that as a new mom. 4. Boppy Changing Pad Liners These I stumbled across on Amazon one day and they ended up saving me. Listen, babies will make a mess of your changing table – especially boys. Even if you buy 1 extra changing pad cover it isn’t enough and it is a pain to always have to wash those every time (which could be multiple times in one day) baby gets it dirty. These are easy and lay right on top of changing pad cover. It is about $12 for 3 of them which is a lot cheaper than buying a bunch of back up covers at $20-30 a pop! 6. Aquaphor My pediatrician recommended this and we used it for everything. It is the best for diaper rash, dry skin, eczema, rash, you name it. This should be a staple in your house. 7. Diaper Dekor This one is not pictured above but I thought I would throw in a bonus for ya! This is the best diaper pail. It masks the smells much better than all other diaper pails. Worth the extra money on this one. 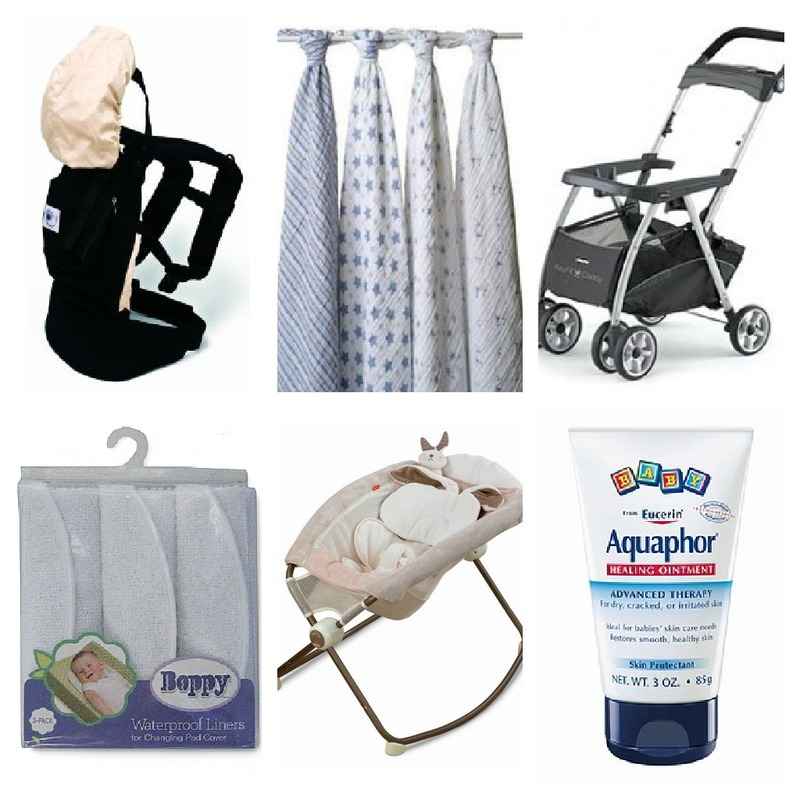 This entry was tagged baby, baby gear, motherhood, newborn, SJ. Bookmark the permalink.